Honest Pet Products – Great for Your Pets, The Environment and Those in Need! - Petpav - Your Online Magazine for All Things Pet! When you are looking to buy your beloved cats and dogs toys or any other accessory, you always look for the best products. You want something that is fun, durable, and safe for your pet children. What if you could buy toys for your cats or dogs that are not only are fun, adorable and safe, but are eco-friendly AND manufactured by people who are underprivileged? Well, Honest Pet Product does all that and more! Honest Pet Products have your pets in mind as they manufacture fabulous toys and accessories from the most truly natural, safe, and durable materials possible. Their products are even more natural than other ‘eco-friendly’ products because they are not simply repackaged recycled plastics and synthetics called ‘eco-friendly’! And, therefore they are not only durable but fun, safe for your pets and last a long time! Honest Pet Products creates dog and cat toys that are truly safe for the planet. They use materials in their most truly natural form to promote sustainability and carbon footprint reduction. Their quality gifts are fun and heal the planet, providing us all safer lives. Honest Pet Product offered their first line of toys out of truly natural hemp and wool while offering other natural, durable toys and accessories. The hemp plant produces the strongest of all plant fibers, resulting in toys that are twice as strong as cotton toys. Because hemp fabrics are naturally anti-bacterial, anti-microbial, mildew-free and rot-free, they are healthier for your beloved pet! Since hemp is a plant, it is 100% biodegradable and therefore replenishes the soil. Hemp toys are pure, natural and safer than toys made of synthetics, plastics and rubber. 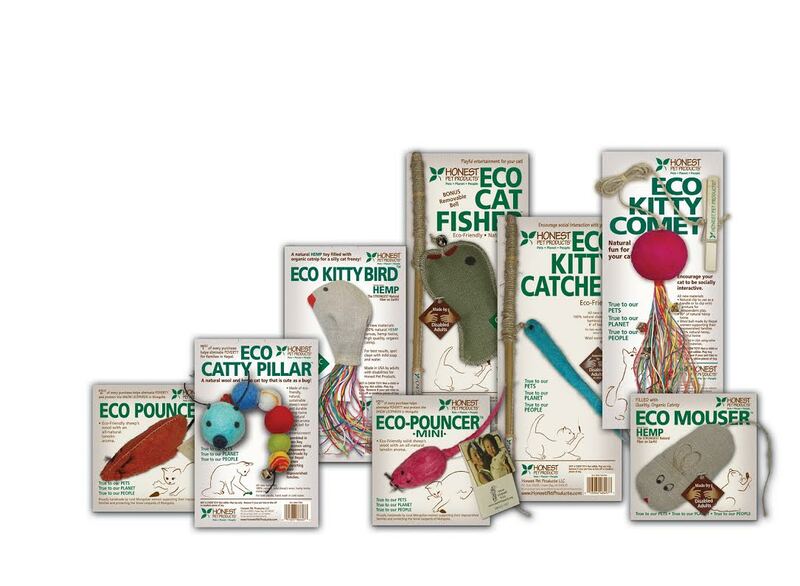 If you are looking for something for your kitty, Honest Pet Products offers some great cat toys such as the Eco Catty Pillar, the Eco Kitty Bird and the Eco Pouncer that keep our cats engaged and active. They use sustainable hemp fabrics, organic wools, organic catnip, and organic oils & extracts in their quality toys and shampoos. If you are looking for something fabulous for your dog(s), Honest Pet Products offers Eco Fetchin’ Sticks, Eco Fetcher, an Eco Fly-n-Tug, their Honest Clean Organic Dog Shampoo and more! Their products are so durable that your dog can chew it, toss it around and it will last much longer than your average dog toy. 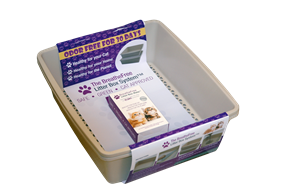 AND the Eco Fletcher is soft on your dog’s teeth so you aren’t nervous about tossing it to your dogs! Dogs love the Eco Fetcher! Honest Pet Products mission statement is to help economically support and emotionally encourage hardworking people with cognitive and developmental disabilities whose job it is to actually make their hemp toys in Green Bay, WI. Their 100% truly natural wool cat toys are handmade in Mongolia by women of impoverished, nomadic herding families living without many basic needs. Through the Snow Leopard Trust’s Fair Trade cooperative, these families earn a living with their traditional wool-working skills. In exchange, herders are protecting the endangered snow leopards that share their habits. Most recently Honest Pet Products entered into a purchasing agreement with a fair trade company that employs women who hand make the felt balls in 2 of the newest cat toys. How AMAZING is that. Makes you want to buy hundreds of their products! Everyone is recognizing how great Honest Pet Products’ line of eco-toys and accessories are for your pets. In fact, Honest Pet Products received the Blue Ribbon for the 2014 Dream Big Small Business of the Year Award from the U. S. Chamber of Commerce and 2014 Editor’s Choice Award! There are so many reasons to buy your cats or dogs some toys and/or accessories from Honest Pet Products. Your cats or dogs will love them, they are affordable, eco-friendly and most importantly contribute to the lives of impoverished and disabled men and women who create them. 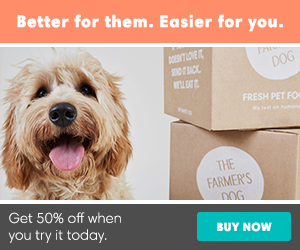 Buy something great for your cat or dog today. You and your beloved pet will be happy you did! Take a look today! http://www.honestpetproducts.com!